Welcome to the website for the band Tongues of Fire and musician Tim Hill. Tongues of Fire play in the streets, on festival stages, in clubs and concert halls and in the landscape. 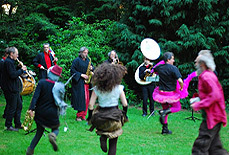 A riot of reeds, percussion and brass they make a ‘joyful noise’ for dreaming, dancing and celebration. “Referencing the collective shamanic voodoo of Sun Ra and Albert Ayler’s mystical shrieks and shronks, they fire up an unholy modal roustabout of a party. 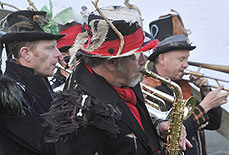 The band draws on traditions of street, circus and village bands, the sounds of church and chapel, the free jazz marches of Albert Ayler and the cosmic carnival of Sun Ra. They also play new music by Tim Hill especially written for brass, reeds and drums. The result is a rich and unique sound. "Wicked big band jazz from the excellent Nanny Tango label. 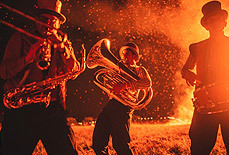 A seven piece brass band dropping dance floor devastating marching tunes and each single comes with an illustrated 8 page manifesto of the band."